Cards by Jessi: Wishing you Luck! This is the March image for the Sassy Studio Design Progressive Challenge at Facebook, so join in the fun and you can get the image for free. 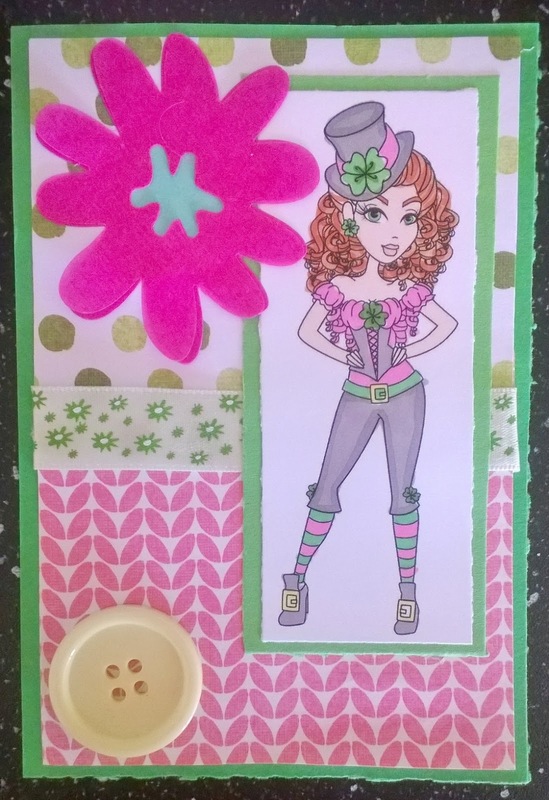 I'm entering my card into these challenges: Crazy Challenge (Flowers),Fab'n'Funky (Flowers), 613 Avenue (ATG), Open-Minded Crafting Fun (Luck/St Patrick's Day) and Crafty Friends (ATG). Lovely card, with a beautiful image. Thanks for joining us at Crafty Friends. A pretty girlie card. Love that sassy image and your choice of design papers compliments it beautifully. Glad you dropped it off on the front porch at 613 Avenue Create this week. This is a lovely creation. Great design and great the image. Just perfect for this challenge. Thank you for sharing with us over here at Open-Minded Crafting Fun Challenge and best of luck with your entry. Great card - love the colours you've used. Thanks for joining us at Fab'n'Funky. I love the addition of colors you used, and the image itself. Thanks for joining us at Open-Minded Crafting Fun! beautiful work, what a gorgeous design! love this! thanks for playing along at open-minded crafting fun!! Great image! Love that big pink flowers!! Great colors!! Love it! Thanks so much for playing along with us at Open-Minded Crafting Fun Challenges!!! Good Luck! I hope we see you again! !